I traded a few e-mails with David Pfiffer from The Department of Recreation, Parks and Open Space the other day to get some more information about the Northside Park. Keep in mind that things are still being figured out, so some of these answers may not end up being the reality once the park opens. 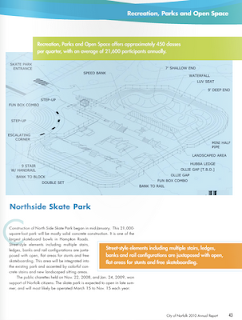 I just saw in the 2010 Norfolk Annual Report that the park is expected to be open from March 15-Nov 15th. I was wondering why the park won't be open year round. Due to budgetary constraints the park will only operate 44 out of 52 weeks per year (March thru late-December). At this time there is nothing that can be done to change the operating hours since the city’s operating budget for Fiscal Year 2011 (which starts this July 1) is being approved tomorrow, Tuesday May 18th. City administration has pledged to take a look at this issue next year as we plan our Fiscal Year 2012 budget (which starts July 1, 2011). Is this because the park will be staffed? What prompted the decision to have the park staffed? The park will be staffed at all times it is open; staffing is necessary as a way to verify that proper safety precautions are being followed and that member ID’s were issued & legal waivers were signed. What other rules will the park have? Other park rules are still being verified; the attorney’s have set most of the safety rules. Will the park require some type of membership? The same Citywide membership Activity ID card and admin fees will be used at the skate park as the Recreation center Activity ID cards listed in the quarterly Good Times publication: Children 17-and-under $5; Adults 18-64 $10. Single Day passes: $10 all ages. 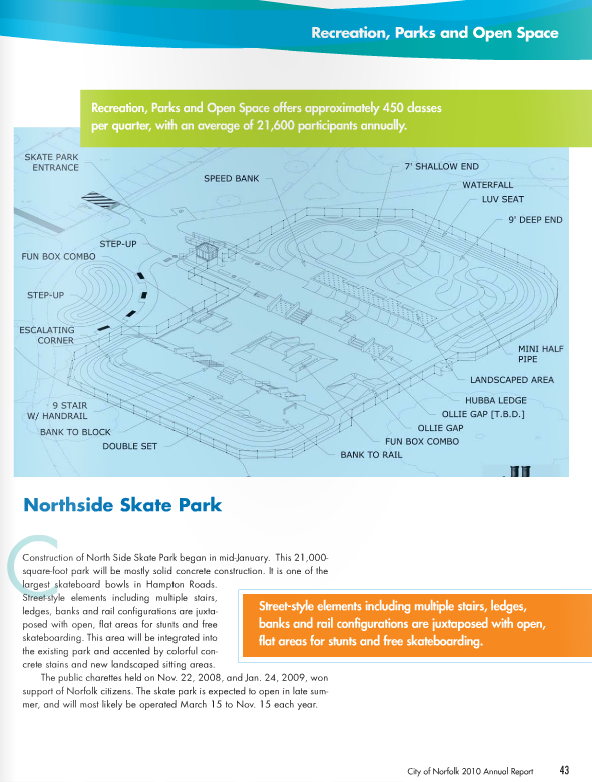 The Activity ID cards can be obtained at the skate park as well as about a ½-dozen other citywide locations as listed on our website, and are good for a year and will initially cost the same nominal admin fee for all City and non-City residents, although that could increase at some point for non-City residents. What type of safety equipment will be required? Helmets will be required by anyone inside the skating area, and it’s likely that knee & elbow pads will be required on children under certain ages. Do you have an estimated date of the opening? Late summer is still the target opening date; we’re shooting for opening somewhere between Sept. 20 – 30, but it has been hard to predict all the problems and delays associated with construction at the site, including Grindline having all their equipment stolen from job site storage trailer. Personally i think a skatepark would be a lot less of a hassle for everyone involved if they got rid of the fence and supervision and rules and just let us charge it, but I doubt the lawyers would ever let that happen. So, since I live in Suffolk, I have to pay $50 a year to skate a public skate park. And only for half a year? And wear a helmet? Come on Norfolk. 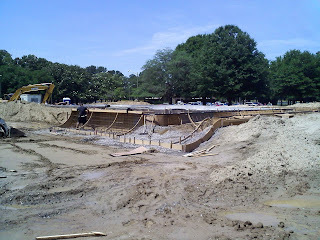 Most of our parks in the Atlanta area are free and unsupervised but one (Brook Run) is pay/supervised/helmets. The silver lining is that it is clean and never crowded. However it is open all year of course. A new city is taking it over soon and has not announced how they are going to run it...but they realize it looses money. Hopefully Norfolk will realize it is a waste and make it free - or at least year round. Good luck. uh I thought they said this was going to be a free park, so what now you gotta travel to city hall and get the dumbass card to skate???? and oh yeah the ID card cost moola as in cash money yo.